Mike Wallace is worth a look this week. He was disappointing in the opening half against the Patriots but Ryan Tannehill is still averaging 18 points per game this season and is available in about 80% of leagues. The Titans quarterback has been disappointing so far ranking 17th of the 36 quarterbacks who have taken a snap so far. However, this week he faces an Oakland Raiders defence that has already given up 70 points and over 1,000 yards. Cash in. This probably doesn’t need saying but some of you might expect Keenum to finally throw a touchdown this week as he faces the 29th ranked Buccaneers defence. Don’t even think about it. Through the first two weeks, Crowell has been a top-10 fantasy running back and is still available in about 30% of leagues. If he is owned, the likelihood is that he’s not being started so put in a trade offer. Despite only being the back-up running back on the Falcons, Coleman is averaging 15 points a game and faces a Saints defence this week that gave up big fantasy numbers on the ground in week one. Whittaker is available in most leagues but, while decent against the 49ers, is not a three down back and will likely be sharing snaps with Cameron Artis-Payne against a very, very good Vikings defence. Probably because his quarterback went down before the season even started, but Diggs is available in nearly 20% of leagues and, if yours is one of them, get that waiver claim in ASAP. Wallace is quietly having himself a decent start to the season averaging 19.5 points per game. Available in over 35% of leagues, he faces a Jaguars secondary this weekend that has proven inept at defending the pass this season. 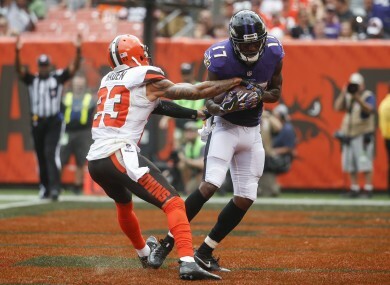 The Browns receiver has been a revelation in his first two games but, with the likelihood that Cleveland could be starting their third quarterback in as many games this weekend, it might be best to avoid the rookie. Through two weeks of the season and you lot are proving to be quite good at this fantasy lark. In week one, we had three teams across the four leagues finish on 132 points with Stephen Van Loon‘s ‘Team Van Loon’ coming out on top in the tie-breaker with 11 touchdowns scored. Week two was also won with 132 points, this time it was Dara O’Brien‘s ‘South Circular Clampers’ who was way out on his own. Email “The Wire: NFL week 3 fantasy football advice”. Feedback on “The Wire: NFL week 3 fantasy football advice”.